Highclere Castle is the home of the 8th Earl and Countess of Carnarvon. 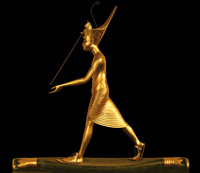 The Egyptian antiquities room - a comprehensive exhibition with exhibits over 3,500 years old. A walk around the exterior of the house and to the Secret Garden (weather permitting). 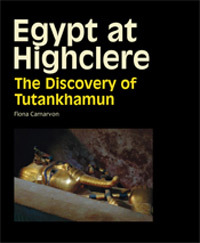 If it is raining we show a DVD about the finding of the tomb of Tutankhamun. 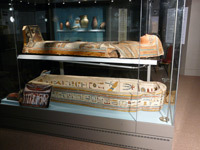 The "Hands On" room where children may dress up in replica Egyptian costume and jewellery, handle replica artefacts, draw, do stencils, read, build a pyramid, make a cartouche with their name in hieroglyphs etc. The charge is £5.00 + VAT per child with 1 adult to 10 children free. 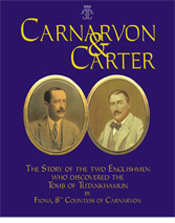 In addition to the schedule of Option ONE, the children continue from the Antiquities Room on the path to discovery which culminates in a recreation of the treasures found by Lord Carnarvon and Howard Carter. For schools wishing to eat a packed lunch during their visit we are usually able to provide a room. Option One: £5.00 + VAT p.p (Minimum charge £75.00 + VAT). Option Two: £8.00 + VAT p.p (Minimum charge £120.00 + VAT). Normally: 1 adult – 10 children . We also welcome, free of charge, additional adults to accompany children requiring 1-2-1 support; these adults should be listed on the booking form. **Any additional adults above this number must be by prior agreement and will be charged at the same rate as the children. On the day or schools may be invoiced after the event. (Cheques should be made payable to “Highclere Enterprises LLP”). The Exhibition is available to schools Monday to Friday in term time subject to availability. Highclere Castle provides its own risk assessment for school visits. Teachers who have not been before may arrange a preliminary visit, subject to availability.